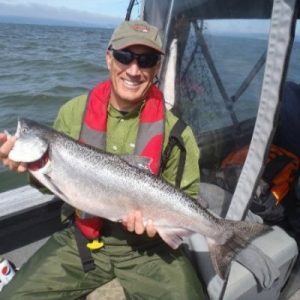 Dr. Douglas J. Austen was selected as the executive director of the American Fisheries Society, the world’s largest and oldest organization of professional fishery scientists and managers, February 2014. Austen is responsible for all of the society’s staff operations and collaborates with partners in Washington, D.C., and other areas to ensure fisheries science is used in policy development and legislation. He will work toward achieving the society’s 2020 Vision — a future where worldwide fisheries production is optimized and sustained while marine, freshwater, and estuarine ecosystems are maintained or improved. He also serves as secretary-general of the World Council of Fisheries Societies, which includes cooperating fisheries societies from a dozen nations. Austen had served as the National Coordinator of the Landscape Conservation Cooperatives with the U.S. Fish and Wildlife Service since 2010. He has handled various roles with the American Fisheries Society, including president of the North Central Division, president of the Illinois chapter, and co-chair of the Fisheries Action Network. He previously served six years as executive director of the Pennsylvania Fish and Boat Commission.